Chester le Streets Alyson Dixon is one of the countries leading marathon runners. 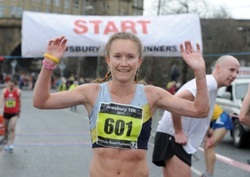 She won the 2011 Brighton Marathon in a time of 2.34.50 before narrowly missing out on an Olympic place with 2.35.46 at this year's London Marathon where she finished 7th Brit. Coached by former World Champion Liz McColgan, we caught up with Alyson shortly after her London exploits. NER: First of all. well done for a good run at London, although just outside your PB, were you pleased with your run and performance? Aly: Thank you. Although I didnt achieve the time I was hoping to, I would say that I am actually more pleased with my run than dissappointed. I know a lot had been said about me attacking Olympic qualification, but this was always a bit of a dream, although a dream I was willing to try my best at acheiving. I knew that to get that final place on the team I would have to run very fast and realistically knew that I wasnt really going to run that fast so I stuck to my own race plan of setting off at 2.30 pace and then picking the pace up at halfway and then again at 20 miles to hopefully finish in around 2.28.30-2.29 range. This was going great until 23 miles when the quads cramped up and never released off. Looking back jumping from 5.43 miling to 5.40 was fine but to jump down again to two miles at 5.30 at the 20 mile point was probably a bit of a fatal mistake. But I have learnt for future races and I am now even more confident that by increasing the pace a little more sensibly that I can still get a sub 2.30 clocking at my next attempt. On a whole, I have taken a lot of positives from the race and came away from it knowing that I gave it my absolute all out there, the fact that I couldnt walk properly for 3 days after showed this, so in general, whilst there is disappointment at not achieving the time, I am mostly pleased with the race. NER: You are coached by former World Champion Liz McColgan. How did this come about? Aly: I first met Liz when she was the team manager at the World Half Marathon Championships in Birmingham back in 2009. We connected straight away and I enjoyed sitting chatting to her about marathon training and where my ambitions lay. She said after that chat that she believed I could one day run 2.27 and believed that I should have moved up to the marathon a long time ago. Not long after I split from my then coach Lindsay Dunn and was chatting a lot to Liz getting some help and advice from her about marathon training. After a few weeks I finally decided to ask her to coach me and she agreed. NER: Female distance running in the North East is incredibly strong the moment. Even though you all compete all over the country, is there a friendly rivalry between the likes of yourself, Freya Murray, Justina Heslop, Sonia Samuels, Rosie Smith etc? Aly: We definitely have some very talented girls in the north east just now who are producing some great performances. I have grown up racing Sonia and Justina and it was great to see Justina come back to the sport after a few years out. Ive also watched Rosie come up through the age groups and think that she has a lot to give to the sport and will produce some very fast times over the next few years. We are all friends but once we get onto the startline of a race we are at war and friendship goes out of the window!! Freya actually lived with me for 2 years when she first came down to the North East, I was mainly responsible for here coming down here. It’s great that we do have this talent and hopefully we can inspire the younger athletes to keep plugging away to take over from us when its time for us oldies to hang up our shoes. NER: Even though you are currently training for marathons, do you still have any aspirations over 10K? Do you still think you could run a PB for 10K? Aly: My plan for over the summer is to concentrate on trying to get my times down over the shorter distance. I believe I can still go sub 16 over 5k and close to 32.30 for 10k. Hopefully with all of the strength I have gained from marathon training I will be able to add a bit of speed and produce some fast time on the roads. I’ve got a few North East races pencilled in where I hope to run fast times this summer so fingers crossed I can get my little legs moving!! NER: What would be a typical week's marathon training for you? At my peak my training hits 120miles a week, I usually aim for 3 or 4 weeks at this before dropping back down to about 110-115. NER: Who would you say have been the main influences in your success? Aly: Liz has been a big influence since I started being coached by her. She has been very good at keeping me positive through bad times. Leading up to last year’s World Champs it was great to have her be able to sit and talk me through what will happen through the champs, from going to the holding camp to living in the village. Not many coaches have experienced that as an athlete so don’t really know what it is like but she has and so could help me prepare myself mentally as well as physically. I think other than Liz, a big influence is my dad. From an early age all I can remember is our house being full of runners. We would have a lot of the Sunderland Harrier lads meeting at our house to go off for their runs so I was brought up witnessing these men putting in the miles and I suppose this work ethic has rubbed off on me. NER: Finally, you are a popular figure in the North East, when will be the next time we are likely to see you compete in the region? Aly: I plan to do a few more races around the north east this summer, I sat down the other day and looked at the fixture list and planned out a few which I would like to run. Of course Blaydon is top of my list. I love Blaydon even though I have never had a good race there but I have always said that I will keep on running it until I win! Others I have pencilled in are the Pier to Pier, Darlington 10k, Silksworth 5k and Tyne Bridge Harriers 5 miles. I have to get entries for them all first though!! North East Runner would like to thank Alyson for speaking to us. We wish her all the best for the future and look forward to seeing her compete in the region soon. North East Runner has also chatted to Ian Harding and Phil Hurst, with more interviews lined up. Click here to read their stories. Find out what's been going on in the area by clicking here. Plan your racing schedule with our up to date racing calendar. Keep up to date with what the North East Runner bloggers are up to by clicking here. Do you have a story? Want to get in touch? We welcome feedback and would love to hear from you. Click here to contact us. North East Runner is still fairly new and developing on almost a daily basis. But how did it all start? Click here to find out. We offer expert advice on Training, Nutrition and Sports Injuries. Click here to read more. We love to hear from readers about their favourite training routes, any advice or stories they may have. Click here to read what others have already sent in.